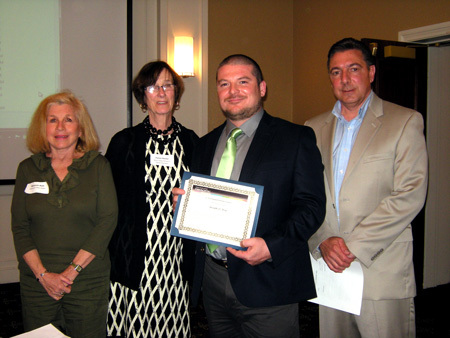 William Shiner, who has served as IPG’s Vice President-Industrial Markets since March 2007, gave an outstanding presentation at NEFC’s annual Scholarship Dinner on May 26, 2015 at the Sheraton Hotel in Framingham, MA. Shiner spoke about the Impact of Fiber Laser Technology on the Materials Processing Market. Shiner is also a Fellow and past President of the Laser Institute of America and currently serves on the Executive Committee of the Laser Institute of America. 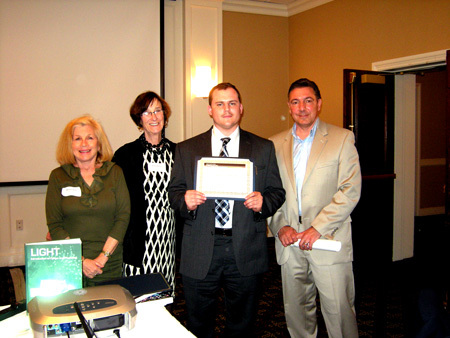 Andrew D. Goodenough – Springfield Technical Community College, Springfield, MA. He was recommended by Professor Nicholas Massa. 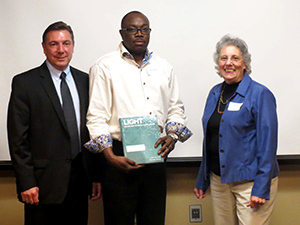 According to NEFC Board Member and Education Chair Fenna Hanes, the organization awarded $1000 to two qualified community college students who will be enrolled for the 2015 – 2016 academic year in a program that offers at least on course in fiber optics. The award is merit-based. Since the scholarship’s inception 18 years ago, the organization has provided more than $60,000 in educational funds to regional students. For further information about the scholarships, please contact NEFC Board Chair Margie Katz at info@nefc.com. 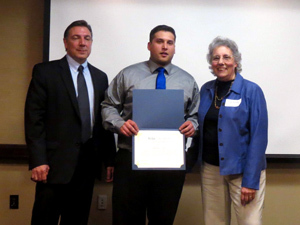 Since the mid-1990s, the New England Fiber Optic Council (NEFC) has awarded $1000 merit-based scholarships to New England community college students entering their second year. The Council invites community college students to apply for the 2014 – 2015 scholarships. 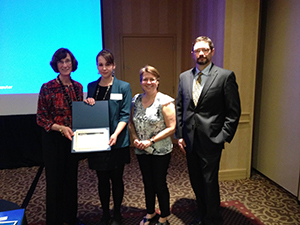 Merit-based $1000 cash award to cover academic year 2014 – 2015 college enrollment expenses. 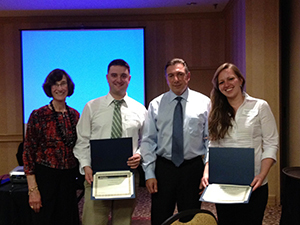 Free attendance for scholarship winners and one guest at the monthly New England Fiber Optic Council dinner meetings. Meetings include presentations by industry experts about state-of-the-art technologies and are an excellent place to network with engineers and technicians working in the industry. Be enrolled in an associate degree program with at least one required course in photonics/fiber optics. Have completed at least 12 credits in the degree program or related curriculum. List of courses in which student is currently registered. Copy of student’s college transcript (s). One letter of recommendation from an instructor familiar with student’s work. Instruct the writer to place the letters in a sealed envelope and to sign across the flap. One page statement, indicating student’s education and career goals, how they relate to photonics/fiber optics and why student should be considered for this scholarship award. Return application no later than March 31, 2014 to NEFC Education Chair Fenna Hanes, see below. Applicants will be notified the week of April 21, 2014 and scholarship winner will be recognized at the May 2014 NEFC Dinner Meeting. 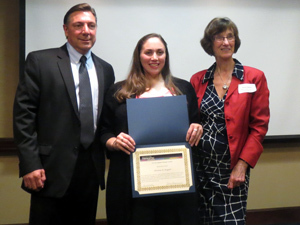 Pictured above from left to right: NEFC Education Chair Fenna Hanes; NEFC Scholarship winner Allie R. Gregoire, NEFC President Lee Kellet, Professor Ron Totten for Professor David Miller, recently deceased. 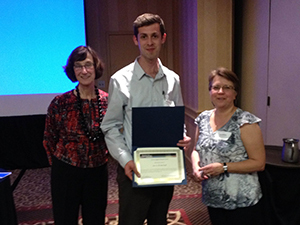 Pictured above from left to right: NEFC Education Chair Fenna Hanes; TRCC Scholarship winner Jan Brinkerhoff; NEFC President Lee Kellet. 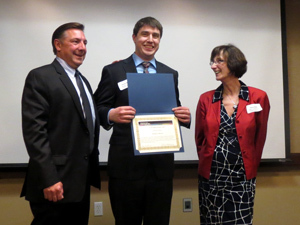 Pictured above from left to right: NEFC Education Chair Fenna Hanes; STCC Scholarship winner Jonathan Forgue; NEFC President Lee Kellet; TRCC Light Scholarship winner Jennifer A. Gallager. With 30 years of experience in computer service engineering, computer technical support, and network administration, it was clear to April that employers were increasingly seeking to outsource IT-work previously completed in-house. Concerned about the future of her career, April decided to return to school, re-route her career path, and enter into the field of lasers and optics technology through the Laser Electro-optics Technology (LEOT) program at STCC. Having found herself captivated with lasers and optics, April hopes to build on her previous knowledge and experiences in order to combine her newfound interest in lasers and optics technologies with her field service and computer network engineering background. April expects to graduate from the LEOT program with honors in May 2013, at which time she hopes to enter a revitalized US job market with new skills that are in high demand. It is her intention to secure a position with a company that will utilize her diverse technical skills, years of computer field service experience, and networking skills. 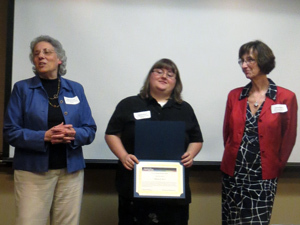 April has been a Dean’s List student at STCC since 2010, and is a member of the Phi Theta Kappa Honor’s Society for two-year colleges. 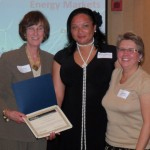 Pictured above from left to right: NEFC Board Member and Educational Chair Fenna Hanes, April Mitchell-Edmonds, NEFC President Lee Kellett. 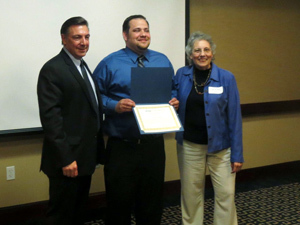 After graduating high school, Kyle immediately entered into the field of audio and visual electronics at Teliris Telepresence. At Teliris, Kyle often found himself filled with questions about the nature of why. Having previously researched the principles of magnetism, light transmission and electricity based on his own curiosities, Kyle realized through his work that a degree in higher education would not only answer many of his budding questions, but would grant him a firmer foundation into the fundamental interconnectivity of technical fields, allowing him to troubleshoot problems on the job with greater efficiency. After receiving his Associates Degree in Laser Electro-optic Technology (LEOT) from STCC, Kyle plans to enter the field, and later, to attain a Bachelor’s degree in a laser/optics related field, with hopes of eventually becoming a member of a research and development team examining new ways to utilize the interference properties of light to achieve a desired goal. Kyle is currently IPC and Eptech certified, and has been employed with Cirtec Medical Systems since 2012 as a welding and laser systems technician. 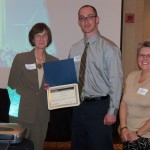 Pictured above from left to right: NEFC Board Member and Educational Chair Fenna Hanes, Kyle Killinger, NEFC President Lee Kellett. 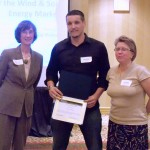 Robert’s interest in the Laser and Fiber Optic Technology (LFOT) program at TRCC first piqued as he was preparing to exit the US Navy, where he was employed as a Nuclear Electronics Technician from 2001 to 2010. At TRCC, Robert has learned about laser construction and operations, has had the opportunity to visit manufacturers and to meet technicians in the field. With this knowledge, he hopes to enter into an electrical engineering Bachelor’s degree program and to eventually work in the design and manufacture of lasers or optical systems, and/or their controls, power supplies, interlock and indication systems. Pictured above from left to right: NEFC Board Member and Educational Chair Fenna Hanes, Robert King , NEFC President Lee Kellett.